Arborist tree services for Davis, Sacramento, SF Bay Area and northern California. Call us at (530) 231-5586. In our experience, irrigation is the most important management concern for trees in most of California. Unfortunately, myths and misinformation abound in this area, leading to much confusion regarding how to effectively irrigate trees. The following series of questions and answers aims to provide practical, horticulture-based knowledge to ensure healthy trees. Figure 1. Drought stressed magnolia. What are the symptoms of drought stress? Acute drought stress causes wilting, leaf burn, leaf drop, twig and branch dieback and, eventually, tree death (Figure 1). Chronic drought stress may be less apparent. 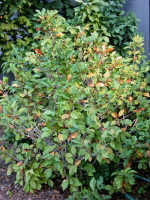 Reduced growth rate may be the only observable symptom of chronic drought stress, or it may be accompanied by reduced leaf size, leaf drop and changes in leaf color or early fall color. Sometimes the only way to determine that a tree is suffering from chronic drought stress is to compare its growth rate, leaf size and color to that of healthy, vigorously growing trees of the same species (Figure 2). Trees suffering from drought stress are also more susceptible to many debilitating insects and diseases. What are the symptoms of excessive irrigation/aeration deficit? Figure 2. 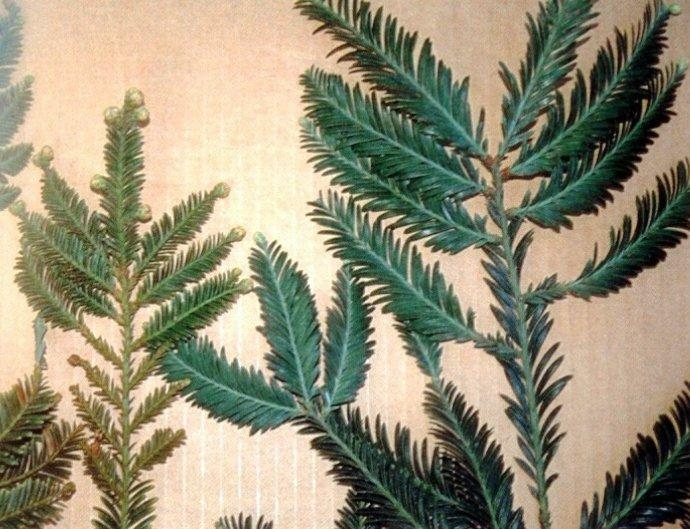 Coast redwood foliage from drought stressed (left) and healthy tree (right). Note the difference in foliage size and color. Excessively frequent irrigation can lead to soils which are anaerobic. Aeration deficits can cause wilting, slowed growth, reduced leaf size, yellow leaves, leaf drop, stem lesions, bleeding, twig and branch dieback, disease susceptibility and eventually, tree death. 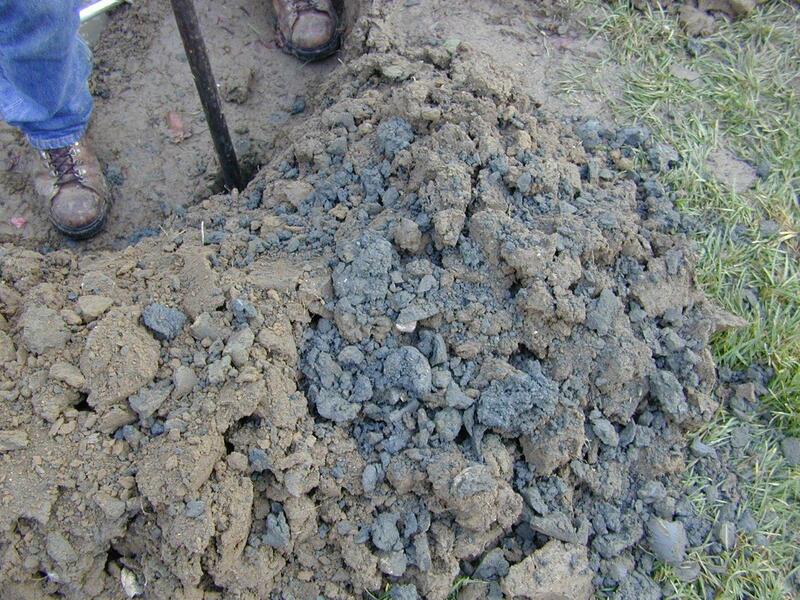 Anaerobic soils often are gray in color and have a putrid smell (Figure 3). Figure 3. Grey soil and a putrid odor are often associated with saturated soil conditions. 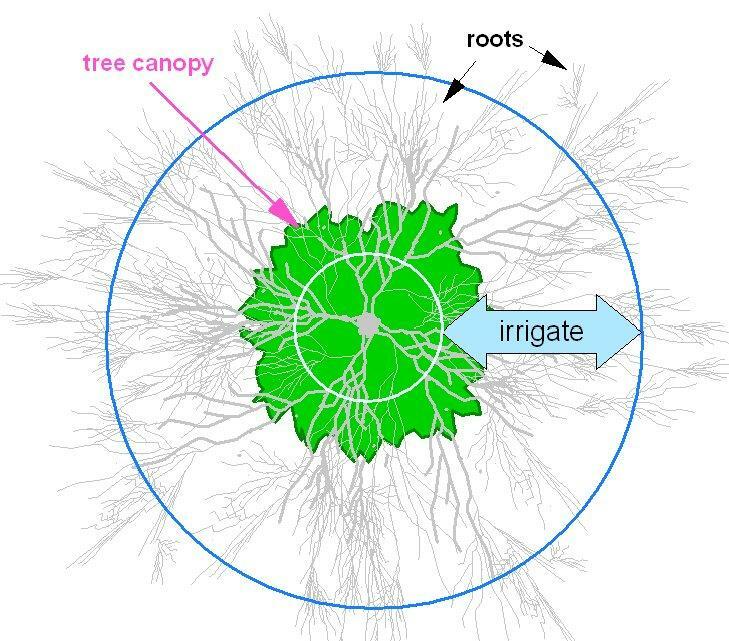 How should we deliver water to trees? There are many methods to deliver water to landscape trees, including: hand watering, bubblers, sprinklers and drip irrigation systems. The most important consideration is to use a system which delivers water to as much of a tree’s root system as possible. 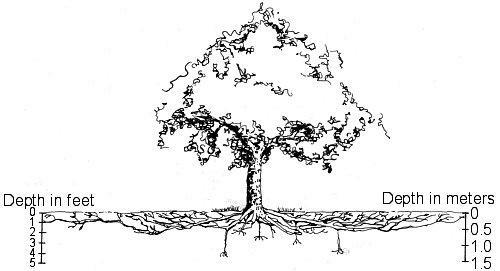 While the size and depth of root systems vary, the roots of established trees typically are less than 3 feet deep and extend to twice the distance from the trunk to the edge of their canopy (dripline) (Figure 4, 5). Figure 4. Drawing of typical tree root system. Typically, tree roots extend well beyond the branches while the majority of tree roots are in the top 2‐3 feet of soil. Newly planted containerized trees, which were probably watered daily in the nursery, should have water applied by hand, directly to their rootballs, to avoid drought stress while the young trees’ root systems are growing into the surrounding soil. This is especially true for spring or summer plantings. Obviously, as a tree grows so will the area that must be irrigated.We generally do not recommend hand watering of established trees. Leaving the hose on at a trickle near the tree’s trunk or watering with a “root feeder” will only deliver water to a small portion of the root system and may waste water as it percolates below tree roots. Installing a hose-end sprinkler or soaker hose to spread water over a large portion of the root system can be an adequate means of irrigating trees. However, this manual method requires a level of attention that many clients do not maintain, and it often results in insufficient or excessive irrigation. Figure 5. Top down view of tree canopy, root system and location to irrigate. If the tree is located on a slope and/or if the soil is clayey and/or compacted, the rate at which water enters the soil (infiltration rate) will be low. In these cases, there are few sprinklers that will apply water slowly enough to avoid runoff. A drip system will apply water at a slow enough rate to allow the percolation of water to the desired depth. We recommend two foot spacing between emitters within the root zone to achieve relatively uniform coverage. Using in-line drip emitters laid out on a grid or spiral on the soil surface can simplify installation and maintenance (Figure 6). Figure 6. 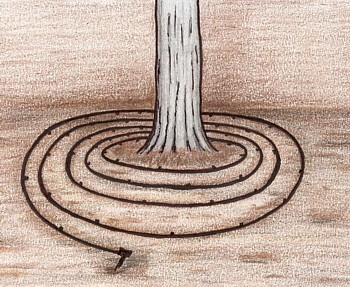 Illustration of spiral arrangement of drip emitters around a tree. We recommend a spacing of two feet between emitters to create a uniform wetting front. The system should be expanded as the tree grows. In most cases, I do not recommend using bubblers to irrigate trees, unless they are to be used temporarily to fill a watering basin surrounding a young tree. 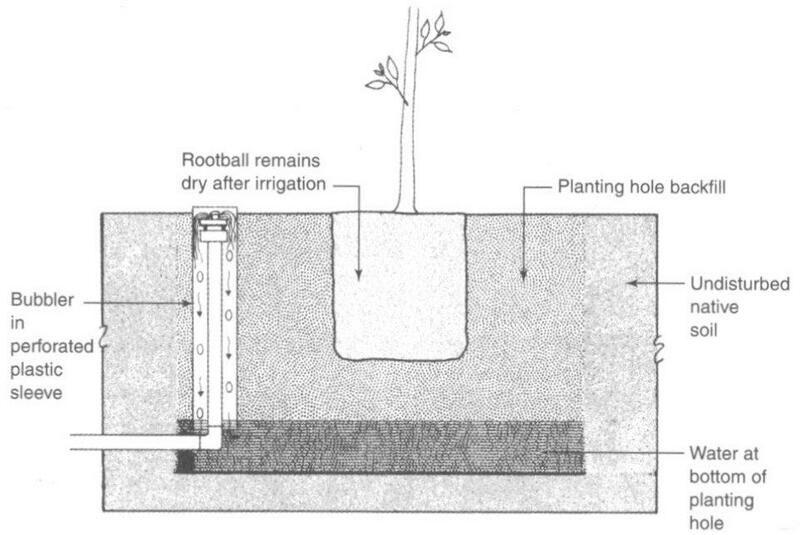 Bubblers installed in tubes will generally not result in uniform wetting of tree root zones (Figure 7). The use of bubblers installed without tubes or a basin will lead to runoff because the application rate of the bubbler far exceeds the infiltration rate of the majority of soils. In some landscapes, there is an overlap between spray and bubbler irrigation patterns. In these cases, the risk of overwatering is elevated. How often should trees be irrigated? Figure 7. Bubblers are often used to irrigate trees. Bubblers installed in tubes (as shown) will wet a limited portion of the tree’s root zone. Bubblers can be used to fill created basins around trees which may be adequate for young trees. Without a basin, runoff and non-uniform wetting of tree root zones is likely. In the Central Valley and Bay Area, most turf species can tolerate irrigation of two times per week or less and most trees or shrubs can tolerate irrigation of once per week or less during the summer months. These general guidelines could be used as a starting point for developing an irrigation schedule. There are several methods to determine when to irrigate trees, including feeling the soil, using soil moisture sensors and using measured or estimated amounts of water lost from plants and soil (evapotranspiration, or ET). Unless the need for water conservation outweighs plant needs, plants should be irrigated before they suffer from chronic drought stress and its attendant effects on growth, appearance, and susceptibility to insects and diseases. Using the feel of the soil to develop an irrigation schedule is not commonly performed. Although simple and cheap, it is also inexact. The following instructions are for the application of this method in landscapes. During a rain-free period just before a scheduled irrigation, dig or auger a few holes per landscape irrigation zone. Dig to a depth of 6 inches for turf or groundcover and 12 inches for shrubs and trees. Is the soil saturated with free water visible? If so, decrease the frequency of irrigation and repeat the test after a couple of irrigation cycles. If the soil can be molded into a ball which crumbles when rubbed, soil moisture is adequate and you may be able to decrease the irrigation frequency somewhat. If the soil is dry enough that it cannot be formed into a ball, you should increase the irrigation frequency and re-test. Soil moisture sensors can provide a more accurate assessment of irrigation needs. Sensors buried in the root zone can accurately measure the depth of irrigation penetration as well as the extent of drying between irrigations (Figure 8). We often install sensors at two or three depths for this purpose. Data can be collected manually or with electronic dataloggers that automatically accumulate data, which can then be graphed and analyzed to determine whether or not the irrigation run time or frequency should be modified. Figure 8. Soil moisture sensors can be installed within the tree's root zone to monitor soil moisture conditions. This information can be used to determine optimal irrigation frequency and run times. Using the evapotranspiration rate (or ET) to schedule irrigations is becoming more common. ET data (based on the rate of water loss for a large stand of grass) are available in many areas and coefficients have been developed for adjusting these data to match the water use of specific crops. ET-based irrigation scheduling works well for the relatively uniform conditions under which field and orchard crops are grown. Landscapes, on the other hand, are complex mixtures of species, sizes, planting densities, and environmental conditions, so estimation of their water use in relation to ET data is more difficult. Landscape coefficients have been developed for estimating the approximate water needs of plants over the course of a growing season. However, given the complex nature of landscapes, we do not recommend relying on the ET method unless it is used in conjunction with the soil feel method or soil moisture sensors. More information regarding the use of ET for estimating landscape water needs can be found at University of California Center for Landscape and Urban Horticulture’s website. How long should I irrigate my trees? The appropriate run time for a given irrigation system will depend on the application rate, distribution uniformity of the irrigation system, environmental conditions, rooting depth and soil. To determine whether or not the desired depth of irrigation penetration has been reached, one can utilize soil moisture sensors as described above; use a tile probe (Figure 9), which easily can be inserted to the depth of moist soil (in the absence of rocks or roots); or dig a hole and feel the soil’s moisture content within the root zone. Figure 9. A tile probe can be inserted into the soil to determine the depth of irrigation penetration. The probe should be easily inserted to the depth of moist soil. Probe in several areas within the root zone. How often should I inspect my irrigation system? The answer to this question depends upon the characteristics of each individual irrigation system. In our experience, sprinkler and bubbler systems are more dependable than drip systems. Some of the possible malfunctions are valves sticking open and plugged emitters (which are usually problems caused by sand or other solids in the irrigation lines), blocked sprinkler heads, and animal damage. The excessive or uneven irrigation caused by these malfunctions could lead to anaerobic soil conditions and/or drought stress. I recommend inspecting the irrigation system once every two weeks during the growing season. We hope this article has helped you to understand the relationship between irrigation and tree health and how to effectively accommodate your trees irrigation needs. We are currently preparing a video to accompany this article. Stay tuned and happy watering. Note: the source of several of the images were from HortScience, Inc., Pleasanton, CA. Owner, Tree Associates Professional Consulting Arborists ASCA Registered Consulting Arborist #375 ISA Board Certified Master Arborist #863B Call us if you need a tree expert! Gallery | This entry was posted in Tree Management and tagged drought stress, evapotranspiration rate, irrigation management, soil moisture content, soil moisture sensors. Bookmark the permalink. Thanks for sharing this information! 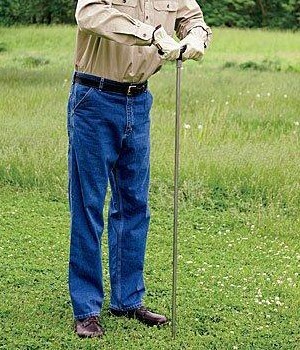 I have been searching for all the info I can find about effective tree Irrigation.This gave me some great insight! Thanks for sharing. Thanks Robert, I am glad it was helpful! Great information, very clear and concise! I read it through twice to try sand absorb as much as I could for future reference. Tree Associates Website (530) 231-5586 Serving the North Central Valley and San Francisco Bay Area Since 1993 including: Sacramento, West Sacramento, Davis, Woodland, Vacaville, Fairfield, Dixon, and Winters.